Why is so much speculative fiction so long? 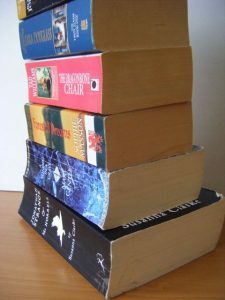 In the past year I have read several stories that were more than 500 pages: Susanna Clarke’s Jonathan Strange and Mr Norrell (782 pages), Brandon Sanderson’s Well of Ascension (763 pages), Eric Flint’s 1632 (592 pages), and Jo Spurrier’s Children of the Black Sun trilogy (more than 1300 pages). I enjoyed them all, for different reasons, but each one dragged at some point, making me wonder if I would ever finish. I’m not saying I don’t like long novels. I do, although generally not back-to-back or side-by-side. If a story is complex and compelling enough to justify a 2.5-inch brick, as Jonathan Strange and Mr Norrell is, I’ll keep reading. But most are not that compelling or entertaining. In far too many, I slog through, hoping the pace will pick up. More often lately I give up. There are at least a dozen books on my shelves of 600+ pages that I may never get around to reading because I just don’t want to commit the time needed. Publishers are partly to blame. Baen, for one, in their submission guidelines, states that they prefer manuscripts between 100,000 and 130,000 words long, and are uncomfortable with manuscripts under 100,000 words. At somewhere between 250 to 300 words per page, their minimum is 330 to 400 pages long. Why? Because the world building needed to transport the readers to imagined worlds needs the extra space? Sometimes, yes. But some authors pack a lot of colour and description into tight spaces. Ursula Le Guin’s A Wizard of Earthsea, less than 200 pages in my edition, is one of the most atmospheric and haunting fantasy worlds I have ever been privileged to visit. Other oldies on my shelves communicated their stories and exotic settings in under 350 pages. Here are a few: Ringworld by Larry Niven, The Hobbit by J R R Tolkien, The Thrall and the Dragon’s Heart by Elizabeth Boyer, Watchtower by Elizabeth A Lynn. Far too often, writers use guidelines like Baen’s 100,000 word minimum as license for self-indulgent excess, padding page after page with digressions and repetitions that drag the story to a halt rather than building complex, multi-layered but still-tight narratives. With so many book being published these days, why should I spend my time with ones that don’t keep me captivated? Brandon Sanderson’s Mistborn trilogy was the trigger for this post. The first book, The Final Empire, was a bit long (643 pages), but with all the main character had to learn—the magic system, the politics, how to deal with her new crew, etc.—the story kept moving along (mostly). But the second book, The Well of Ascension, is even longer (763 pages), with not nearly as much excuse. The amount of new world building and character development doesn’t justify the bloat. I would have liked the book twice as much at half the length.